So sorry! Its been way too long since I last blogged. I have been very busy, doing a lot of traveling around Ethiopia for various reasons. I wanted to let you all in on what I’ve been up to over the past few months. My ‘summer’ started in June. We had a new group of Education volunteers come in to country to begin their Pre-Service Training. I was asked to help with their training since school was out in my community. 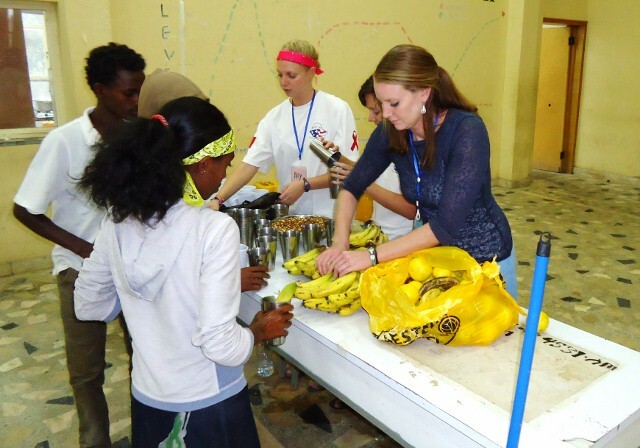 I provided many technical trainings, sharing my experiences of working in the Ethiopian Education System and sharing resources and ideas that the new volunteers could use during their service. During the summer, I also represented PSN (peer support network) in a few trainings. PSN is a committee comprised of peer elected representatives whose role is to empower other PCVs & trainees by supporting their emotional needs and diverse backgrounds. It is absolutely one of my favorite parts of my Peace Corps service so far. I get to spend a lot of time with new volunteers, answering questions and giving advice during their first few months in country. I also write encouraging letters, make phone calls and go to visit other Volunteers to keep their morale up. In September, I was elected as President of PSN. As President, I will be the point person between our committee and the Peace Corps Office in the capitol city, schedule and lead meetings and trainings, ensure PSN members adhere to standard of conduct, and more. I am very excited about the opportunity to serve other Volunteers in Ethiopia. Another big activity that went on this summer was Summer Camp. Tigray Summer Camp 2012 was held in my town of Wukro. We had 35 high school students, age 13-18, come together to learn to lead others. 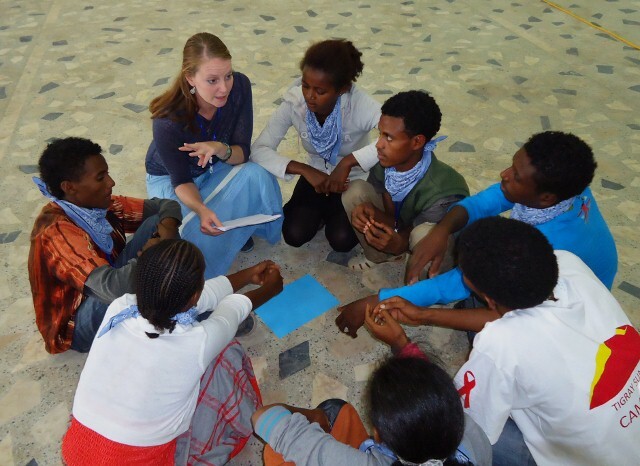 Me and 15 other volunteers from my region of Tigray taught kids important information on health education, specifically about HIV/AIDS, environmental education, leadership and teamwork, gender equality, and more. It was traditional ‘summer camp’ style, with the campers sleeping in dorms, being a part of a team, playing games, and having fun. And of course, we ended everything with a campfire and s’mores! We were all exhausted after the 8 day event, but it was worth it to see the kids’ knowledge, skills, and confidence shoot through the roof over the course of the week. Since school doesn’t start in Ethiopia until October I took a ‘vacation’ around Ethiopia. I started out visiting the historical city of Axum. Axum was one of the first colonies of Ethiopia, dating back more than a thousand years. 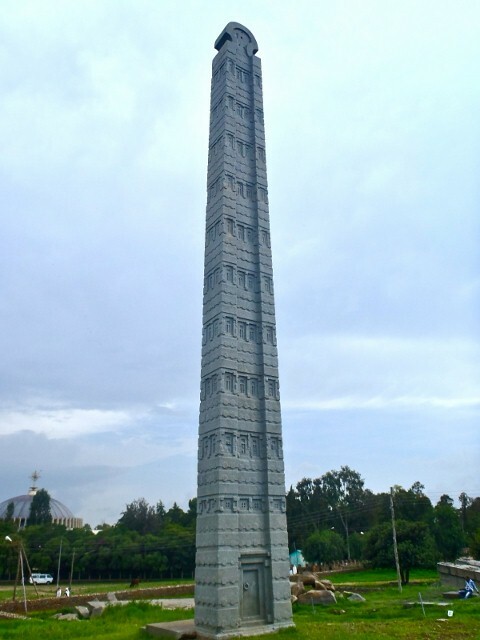 It is one of the most popular tourist sites in Ethiopia. After Axum, me and 2 other Volunteers visited another historical city called Gondar. 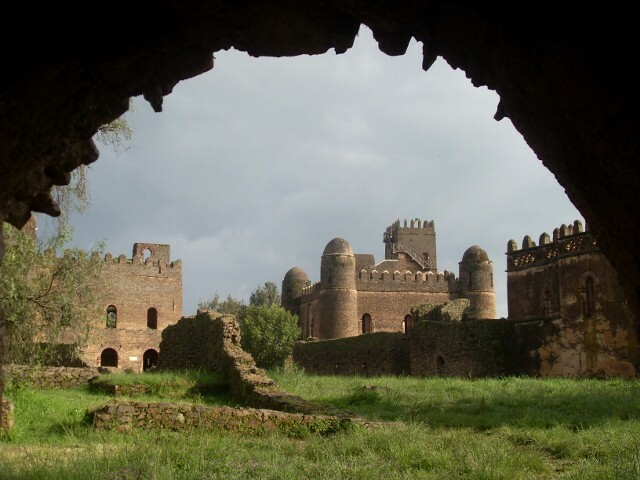 Gondar is home to the Ethiopian empire’s castles of the 17th and 18th century. The history behind the set of castles is fascinating. And it is amazing that they are still standing today. From Gondar, we went north to the Simien Mountains, which are also called ‘The Rooftop of Africa’ because of its expansive area of highlands. 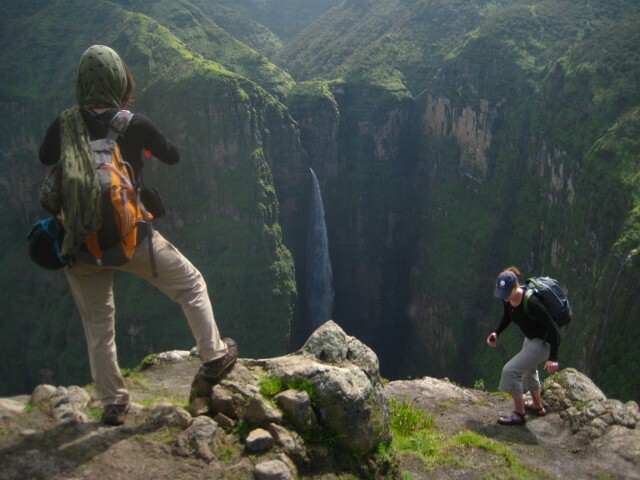 It is also home to Ethiopia’s highest point “Ras Dashen”, which I believe is the 4th highest peak in all of Africa. 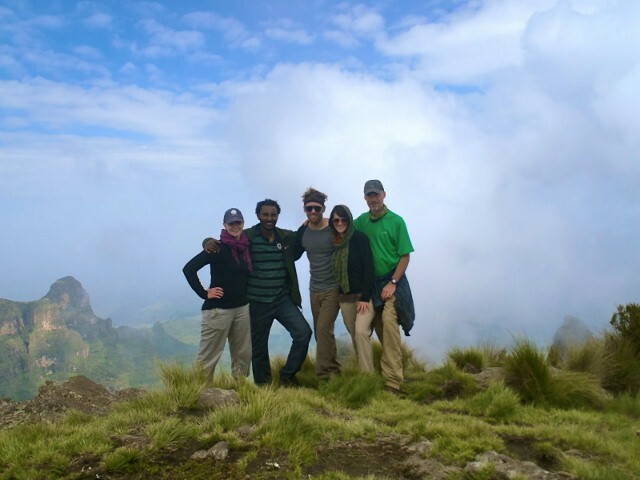 Here, me and 3 other PCVs hiked and camped in the cold, wet highlands of Ethiopia. 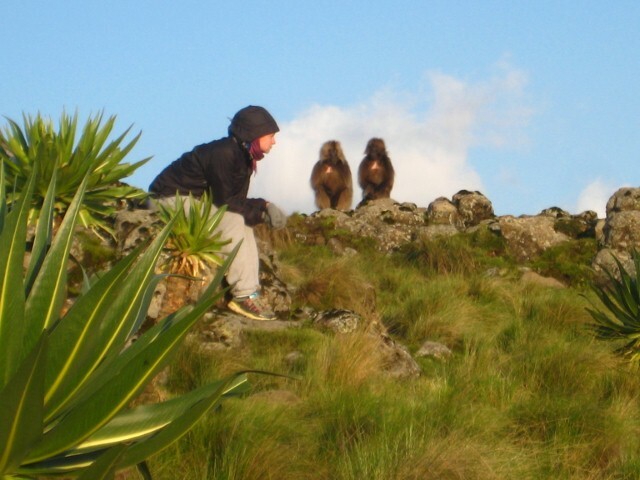 We saw an indigenous monkey species that were so much fun to watch and were the highlight of the trip in my opinion. Camping and hiking was fun, but its not really my cup of tea, and after three full days, I was ready to be done. From the Simien Mountains, I went a bit south to the ‘resort’ town of Bahir Dar. It sits on the south side of Lake Tana, the largest lake in Ethiopia, and is the starting point of the Blue Nile River. We have several PCVs in and around the city, and I got the opportunity to hang out with some of them. We had fresh Blue Nile Perch at a restaurant on the lake. Addis Ababa, the capitol city, was next on the list. All of the people in my group of Education Volunteers that I came into country were there for our Mid-Service Conference (MSC). MSC is a week-long meeting/training where volunteers share ideas for projects, big wigs come in and pretend like they know what its like to be out in the villages, and we go out to eat delicious foreign dinners. We had a really good time. We even got to meet some Returned Peace Corps Volunteers (RPCVs) from Ethiopia and Eritrea that served in the 60s and 70s. 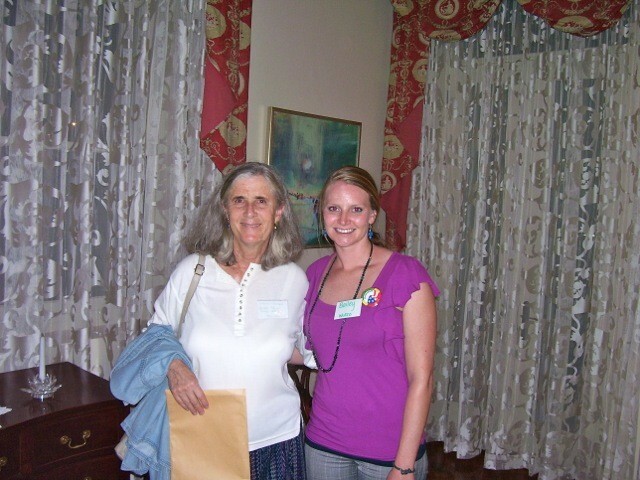 I even met Karen, who served in Wukro, 30some years ago! It was amazing to hear their stories of their service so many years ago. 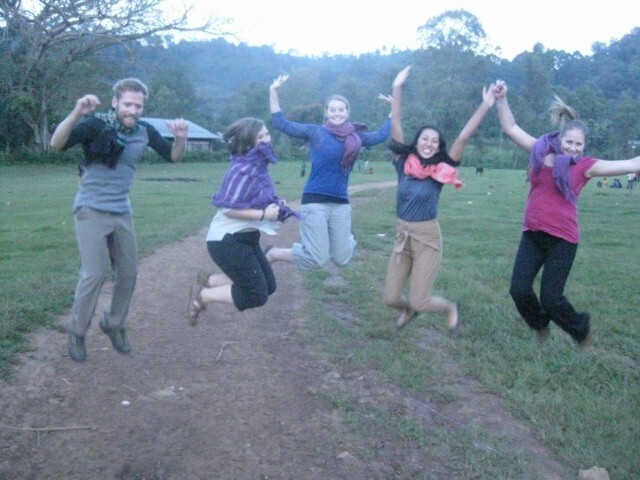 After MSC, I had one week before I needed to be back in Addis Ababa to welcome another new group of Volunteers! So, I decided that I wanted to go visit some other volunteers in the southwestern part of Ethiopia. This was like a whole new world! It was green and forest-like and MUDDY, the complete opposite of where I live where it’s dry and dusty. I got to see some amazing volunteers while I was out there, which is always the best part of traveling. 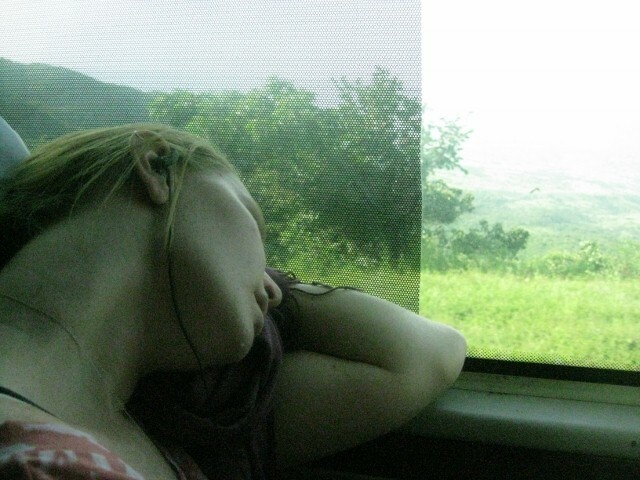 The bus rides were long and uncomfortable, but the scenery was beautiful! Well, that pretty much sums up my summer! Check out the next blog to see what I’m doing for my second year of service and how you can help!